The short story for dinner tonight. J-lo wanted pineapple. 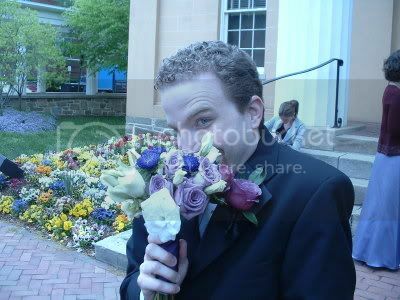 Mmmm??? I happened to be chatting with the Vampire Slayer in Oregon at the time and I asked her about her Pineapple Fried Rice. First...I don't know...I guess there was an outbreak of vampires in beaverland, so she had to leave me. Umpf! 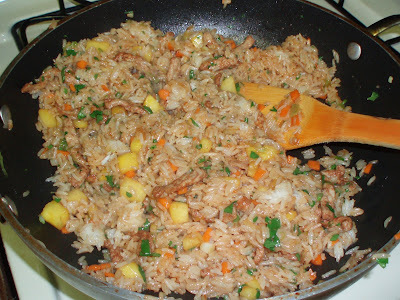 Second...pineapple fried rice? The Vampire Slayer was always talking about it and craving it, so I heard about it, but never saw it or tasted it, but I trust her, so here goes. The recipe she gave me was really basic. I've played around a bit and have added some things. Make sure all your ingredients are prepared and ready to go. This will move fast, just a few minutes. 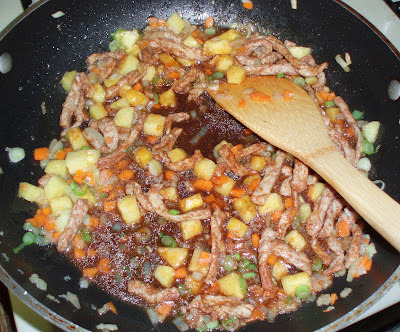 Add the Chinese Five Spice blend and salt to the pork, toss to coat. Heat your largest skillet or wok over high heat. When super hot, add the oil. Give it a moment to shimmer, add the meat. Stir for a brief minute, the meat will start to cook. 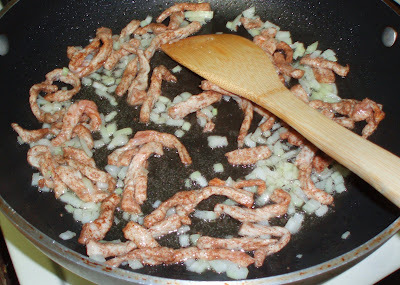 Add the onions, stir until softened, about a minute. 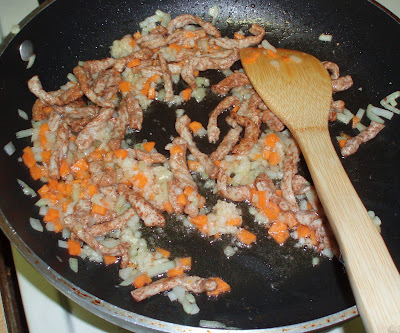 Add the carrot, saute for a minute. Add the garlic and ginger. Stir until fragrant. 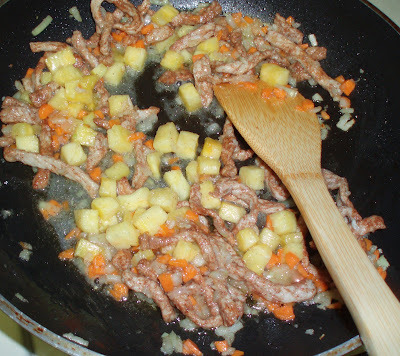 Add the pineapple and it's juice, stir to incorporate and heat through. 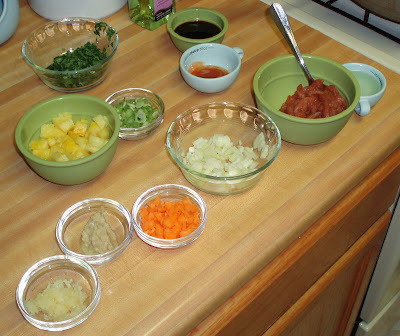 Add the green onions, fish, soy and hot sauces. 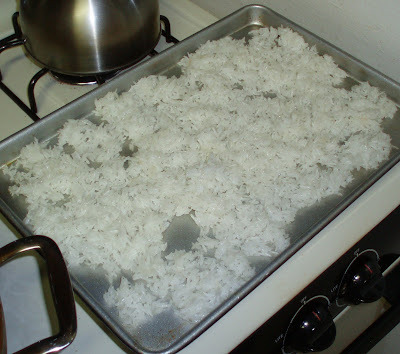 Add the rice and stir to fully incorporate. Give a minute or two to absorb the flavors in your pan. NOTE: The meat is optional. I was able to get a pack of three thin pork chops. I removed all the fat and sliced thinnly. I would also do the same thing with chicken. If I went with shrimp, I'd clean up and cut in half or smaller bites. If I had shrimp, I'd add them after the carrots, as they will only take a moment to cook. Oops...I just realized that Ms. Slayer said to add an egg...oops. Maybe next time. My rice was not day old. So I cooked up a double batch in the rice cooker when I got home. When it was done, I let it steam out for a minute, the spread it out on the pan (sprayed lightly with cooking spray so it didn't stick), the threw it in a warm (300) oven for ten minutes. I think this set the rice up to soak up a little more flavor. The pork & spices cooking with the onions. Add carrots, garlic and ginger. Add the pineapple and some of it's juice. Delicious! It tastes like more!!! And I had another plate full. So much for leftovers for lunch. By taking a few minutes to prepare the ingredients, your dinner will be done in minutes...really, just a few minutes. Don't ask me about the craving - I'm probably pregnant or something. But anyway, this was a satisfying fix. 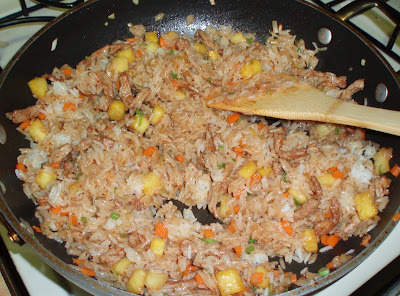 I love fried rice as a main dish in that it's very filling. And having it homemade meant it was far less greasy than what you order from the Chinese take-out place. I realize that I'm commenting like a year after this recipe was posted, but I only just discovered it. 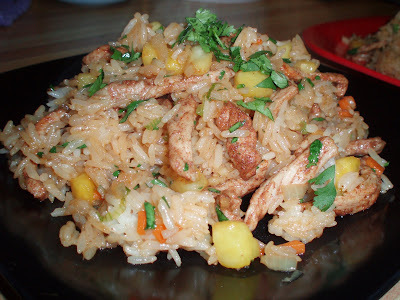 :o) I saw your comment when I was checking out Elise's Ginger Pineapple Rice recipe and when I looked at your link I thought yours looked even better. I made it tonight and it was so delicious. Thank you! Made this again last night. Tasty. Spicy. If you don't want the spice, you can skip the hot sauce. Just FYI.